The talk of the town and many places are about a new scheme going hot on whatsapp circulation, it is not about “Sukanya Samriddhi Account”, and it is about making money or a kind of investment to the expectations of people who are looking to make easy money. The scheme about parents having a daughter who is below 10 years, they need to open an account in her name by paying Rs. 1000 for the first time and has to pay Rs. 100 every month till she completes the age of 21 will get Rs. 6,50,000 for her marriage. How it is possible? Even one who opens an account for his or her infant baby and pays that monthly Rs. 100 at the age of 21, with interest it will come to Rs. 40,000 or so, but how come the amount jump to Rs. 6,50,000 seems a fake message in the name of “Selva Maghal Thirumana Thittam” (Disclaimer: Please, check for such a scheme). If you google and do a search for “Selva Maghal Thirumana Thittam”, you will find a lot of marriage halls in Tamil Nadu but not the information about scheme. What I found was “Sukanya Samriddhi Account” or “Selvamagal Semipu”, which is a Girl Child Prosperity Scheme where a parent or guardian needs to open an account in girl’s name in a post office or authorized commercial bank and earn an interest currently 9.1% (FY 2014-15) to whatever the amount the deposited in that account to a maximum cap of Rs. 1,50,000 per account per year and the amount is exempted under section 80C of income tax, India. Under the scheme, an interest of 9.1 per cent is provided on deposited amount which is tax free. The account under this scheme a saving account can be opened by the parent or legal guardian of a girl child of less than 10 years of age (born on or after: 02-December-2003; For FY 2014-15) with a minimum deposit of ₹ 1,000/- in any post office or authorized branches of commercial bank. Partial withdrawal up to 50 per cent of the account balance is allowed to meet education expenses of the girl child till she attains 18 years of age. The account will remain operative for 21 years from the date of opening of the account or till marriage of the girl child. Minimum deposit amount for this account is ₹ 1,000/- and maximum is ₹ 1,50,000/- per year. From FY 2015-16 the interest earned on account will be tax exempted. As per Finance Bill 2015-16. Birth certificate of girl child along with Address proof and Identity proof of parent or gurdian of the girl child. Below chart is to understand the amount invested and final amount to be received till the girl child attains the age of 21 in Sukanya Samriddhi account. Table gives a clear picture for yearly investment of Rs. 1,000.00 and Rs. 1,50,000.00 for a investment period of 14 years. I think the best part is the motive behind this scheme and the interest rate of Sukanya Samriddhi Account . Thanks for mentioning about this scheme here. Welcome, Sir, and thanks for your thoughts. If I invest in Jan-2019, is it a loss for me? Should I wait until April-2019 to get better interest rates? 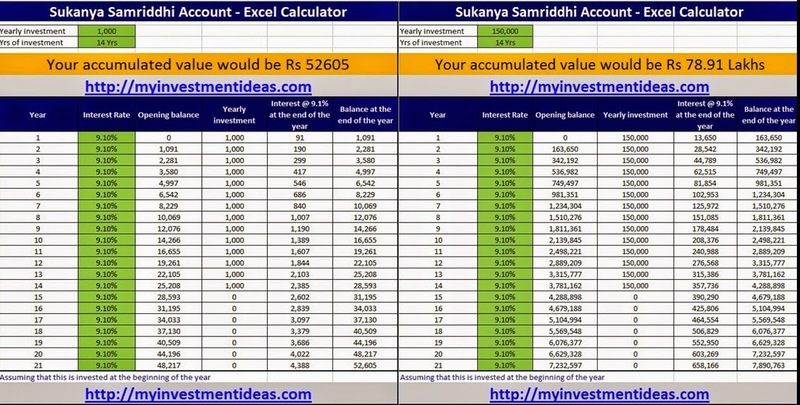 How the compound interest is calculated here. Taking a gander at the comfort of logical adding machine, Rolf Howarth turned out with the plan to create online logical number cruncher in 1996. Square Box Systems Ltd. turned into the host organizations to help this online webpage since the starting of the product.